Those Rudyard Kipling’s words and those colorful novels… a tree house and a duck. Me in my momma’s lap lost in my own world of fantasies jumping and hopping somewhere in some tree house of Rudyard! Coming back to the present time, tree houses are no more a fantasy but a cute reality and perhaps the best gift that you could give to your child – a tree house vacation is what we suggest! The Tree House resorts are more cute and more delightful rather than luxurious and lavish. They represent the world from the eyes of a kid – from the heights of tree – from the green shade and those knitted gaps amid leaves and sparkling sunrays! What a scene! Well you go to visit them to experience the fantasy come alive. Experience the fantasy all at once in this natural setting with www.rezortify.com, where we shortlisted the top 10 resorts that you got to see with your kid! The area is spread over 18 acres, this deluxe Machan Tree House resort review as a five star with one of the spas in the country which is located in Kumarakom, just on the shore of a 205 square kilometer Vembanad Lake. This is one of the largest spas in southern India having two parts: first part is Ayurveda treatments and the second one is Oriental and western style treatments. Bless your skin with various skin treatments consisting of Massage, Reflexology, and Shiatsu. It also includes a special meditation and yoga pavilion on an island in the lagoon. It will only take 30 minutes to drive from the pink city, Jaipur in Rajasthan to come to this resort. This is one of the largest tree house resorts in the world. Enjoy the wonderful amalgamation of nature and luxury among the trees and totally natural setting different from urban existence in this wonderful nature resort. Accommodation is provided into a number of luxury “Nests”. The Hospitality of this resort is awesome. They also organize camel cart rides, night safaris and bird watching tours – the ideal if occupied with kids, they love it! This is one of the best resorts in Kerala located at the entrance of the Wayanad district of Kerala, featuring five tree houses. Vythari Resort is buried in the middle of a tropical rain forest. Stretched over 150 acre, this tree house resort is built around a stream. Houses were built by native tribal people using local materials. Features of this resort include Ayurvedic Spa, Swimming Pool and Health Club – yes, that in tree house setting too! If you are searching for a family-run tree house resort then Manali Tree House Cottages is the place where you ought to come. It makes you feel like at home away from home. The whole resort is build up on an oak tree on a farm near Katrian village, bounded by orchards and lush fields. It only takes 30 minutes to come to this place drive from Manali. In winter, all places are covered with snow. Hospitality is very warm and friendly and serves home cooked meals. Journey to Vanya Tiger Resort not only make your experience good but it also makes your trip memorable. The journey of this begins with a drive of a 6 kilometers along the hills via Jeep. The resort has only two tree houses at the corner of the Periyar Tiger reserve. Whole day you can see the large number of animals marauding in their natural turf, which include tigers and bison. There is no house or resort in the area. The whole area is around 21 acres where this tree house resort is built. 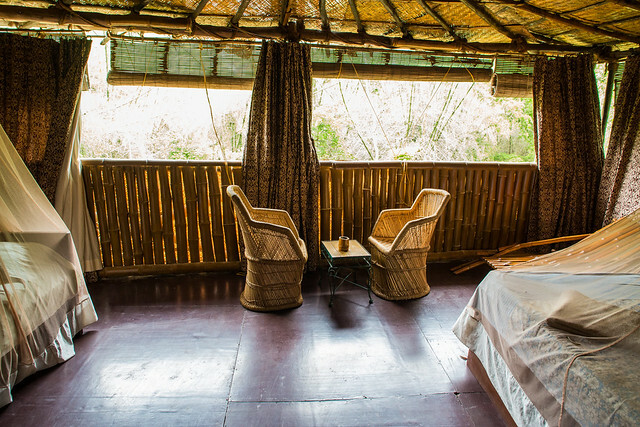 It is situated in the border area of Bandhavgarh National Park; featuring five exclusive tree houses, the Tree House Hideaway is an exclusive property. All rooms have their own bathrooms, hot water, living area, mosquito netting, air conditioning and power back-up. Each balcony faces the natural park and no wonders if you can spot the wild animals having a good time with their fellow relatives! Safari Land Tree House Resort is located in the foothills of the Nilgiri Mountain range in Masinagudi. Whole area extends to over 5 acres and has 5 different types of tree house accommodations. Managed by Nawab Shafath Ali Khan, plenty of activities are conducted within the resorts including of nature walks, trekking, horse and elephant riding, bird watching and safaris. Situated in God’s own place, Kerala, the Rainforest Boutique Resort would rather ask you to spend a few days more for you would not be able to manage to run that quick from there! This resort is set on 7 acres of un-spoilt jungle, and design is uniquely designed by a Swiss architect. The view of Kerala’s largest waterfalls from this tree house resort is one of the best views to glance from the resort. The whole resort is installed in the Sholayar rainforest. Its now the time to come out of this magical world. The lush greens and chirping birds, river nearby and clouds caress… the world of imagination brought into reality in above mentioned resorts. www.rezortify.com will keep making you acquainted with natural resorts, spa and beauty resorts along with love and romance resorts. Request your beta access at www.rezortify.com today!